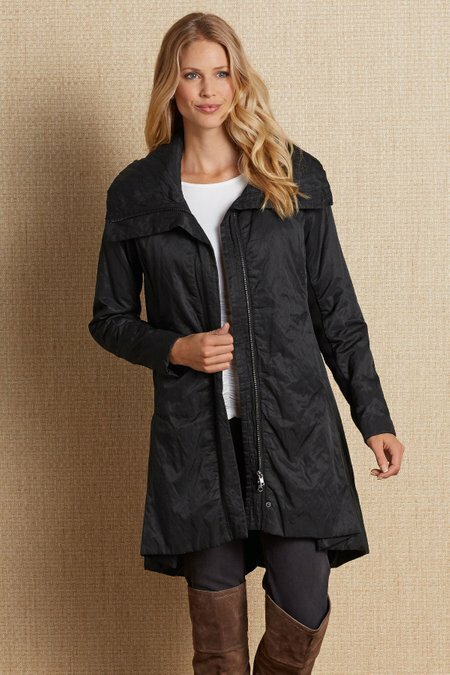 Whatever the weather, you're warm and ready in this stylish coat of slick, water-resistant cotton-metal fabric, fashioned with a hidden 2-way zip closure, wing collar (unzipped), front and back pleats, rib knit under sleeves and on-seam pockets. Flattering A-line shape and full satin lining top off this attractive and practical coat. Cotton/poly/metal. 37-1/2" long.